A Cuban sandwich, known as a Cubano, is a variation on a grilled ham-and-cheese sandwich that was born in Florida. 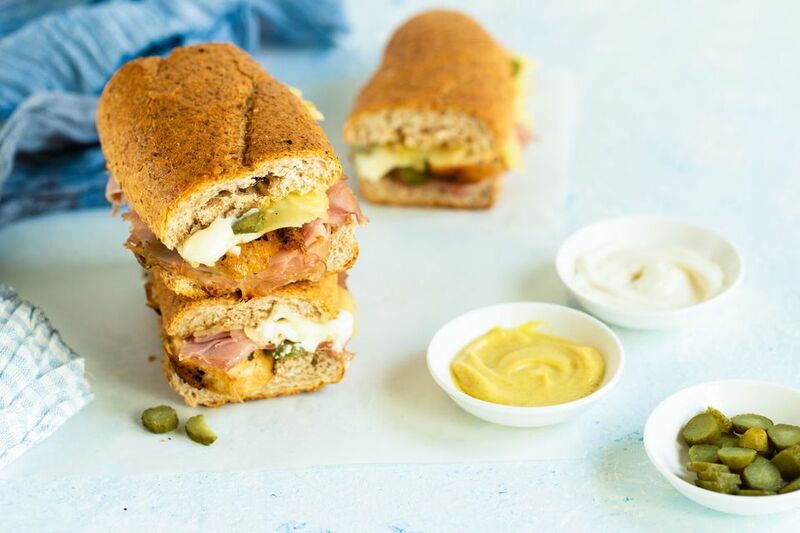 This undeniably delicious sandwich is grilled and made with ham, pork, Swiss cheese, pickles, mustard, Cuban bread, and sometimes salami. The essential ingredient is the roasted pork, traditionally marinated in a mojo sauce redolent with orange juice, lime juice, garlic, oregano, and cumin before roasting. Cut the loaf of bread into quarters and slice each quarter in half horizontally for the sandwiches. Spread the mustard or mayonnaise on the bread. Then make each sandwich by layering the roasted ham, pork, cheese, and dill pickles. Lightly coat the cooking surface of the griddle or frying pan with cooking spray or butter. Place one sandwich on the hot surface. Put a clean, heavy skillet on top of the sandwich to flatten it. Press the bread down to about 1/3 of its original size. Leave the skillet on top of the sandwich and grill for 1 or 2 minutes. Lift the heavy skillet, turn the sandwich over and repeat this step for the other side of the sandwich. The cheese should be melted and the bread golden brown. Slice each sandwich in half diagonally, serve, and enjoy! Instead of mayonnaise or mustard, some purists use butter, while others add lettuce and tomatoes after the sandwich has been grilled. If you can't find Cuban bread, a long loaf of French or Italian bread will do. Some people make do with Italian bread for panini, which is another grilled sandwich similar to a Cubano. A Cubano is street food par excellence that had its start as a sandwich popular with the working classes. This hearty hot meat-and-cheese meal was purchased by Cuban workers in the late 1800s early 1900s from vendors stationed inside and outside their places of work. When these workers emigrated to the United States, in particular, Florida that has a large enclave of Cubans, they brought this delicious sandwich tradition with them.